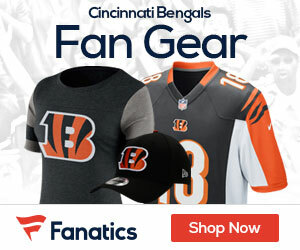 PITTSBURGH STEELERS–AFC NORTH (10-6) AT CINCINNATI BENGALS–AFC NORTH (12-4)? LAST GAME 12/13/15: Steelers 33 at Bengals 20. Pittsburgh RB DeAngelo Williams rushes for 76 yards & 2 TDs. Steelers CB William Gay adds 23-yard INT-TD. LAST PLAYOFF 1/8/06: Steelers 31 at Bengals 17. Pittsburgh QB Ben Roethlisberger throws for 208 yards & 3 TDs (148.7 passer rating). Steelers WR Cedrick Wilson has 104 rec. yards & TD. BROADCAST CBS (8:15 PM ET): Jim Nantz, Phill Simms, Tracy Wolfson (field reporter). Westwood One: Kevin Harlan, Dan Fouts, Laura Okmin (field reporter). SIRIUS: 88 (WW1), 83 (Pit), 82 (Cin). XM: 88 (WW1), 226 (Pit), 82 (Cin). TEAMS MEET for 2nd time in postseason. Steelers defeated Bengals 31-17 in Wild Card Playoff on 1/8/06. Pit. leads all-time regular-season series 56-35 & clubs split 2015 season series. STEELERS: Have 33-22 (.600) all-time postseason record, 2nd all-time in total playoff wins & 4th all-time in win pct. Need 1 playoff win to tie Dallas (34) for most all-time. In 2005, became 1st No. 6 seed in NFL history to win SB (XL vs. Seahawks). Set NFL record for 2-point conversions in single season, converting 8 of 11 attempts in 2015…QB BEN ROETHLISBERGER led NFL with 328.2 passing yards per game in 2015 (3,938 yards in 12 games), 3rd-highest single-season average in NFL history. Has 10-5 career postseason record. Has 11-2 record at Cincinnati (including playoffs) & has passed for 3,010 yards with 19 TDs vs. 9 INTs for 98.1 rating. In 1/8/06 playoff meeting, completed 14 of 19 (73.7 percent) for 208 yards with 3 TDs vs. 0 INTs for 148.7 passer rating…RB DE ANGELO WILLIAMS tied for 1st in NFL with 11 rush TDs & ranked 3rd amongst AFC RBs with 1,274 scrimmage yards in 2015. In past 8, is averaging 112.1 scrimmage yards per game & has 8 rush TDs…WR ANTONIO BROWN had career-best 136 catches, tied for 2nd-most in single season in NFL history, & ranked 2nd in the NFL with franchise-record 1,834 receiving yards. Led NFL with 129 catches in 2014 & his 265 receptions in past 2 seasons are most of any 2-year span in history. 1 of 2 in NFL history with back-to-back 120-catch seasons (HOFer CRIS CARTER). Led team with 10 TD catches & joined HINES WARD (2002-03) as only Steelers with consecutive 10-TD catch seasons. WR MARTAVIS BRYANT has 16 TDs in 22 career games (including playoffs). Had 5 catches for 61 yards & TD in only career playoff game (1/3/15 Wild Card vs. Ravens). TE HEATH MILLER has 46 career postseason catches & needs 6 to surpass KEITH JACKSON (51) for 5th-most by TE in playoff history…In 13 career playoff games, LB JAMES HARRISON has 6.5 sacks & 100-yard INT-TD (SB XLIII vs. Az. ), tied for 2nd-longest in playoff history. LB LAWRENCE TIMMONS led team with 119 tackles. Since 2007, is only NFL player with 30+ sacks (33) & 10+ INTs (10). S MIKE MITCHELL led team with 3 INTs & had career-best 9 PDs…Club had 3 players selected to 2016 Pro Bowl (QB Roethlisberger, WR Brown, G DAVID DE CASTRO). BENGALS: Club has reached postseason for 7th time under head coach MARVIN LEWIS (2005, 2009, 2011-2015) & makes franchise-record 5th consecutive playoff appearance. Bengals aim for 1st postseason win since 1/6/91 against Houston Oilers (Wild Card). Tied franchise-record for regular-season wins (12)…QB ANDY DALTON has 50-26-1 (.656) record, highest win pct. of any Bengals QB (min. 20 starts). Has 24 career road wins, most of any starting QB in Super Bowl era in 1st 5 NFL seasons. In past 4, QB AJ MC CARRON has completed 76 of 115 (66.1 pct.) for 832 yards with 6 TDs vs. 2 INTs for 97.4 rating, incl. 280 yards & 2 TDs vs. Steelers in Week 14…RB JEREMY HILL tied for 1st in NFL with 11 rush TDs & led team with 794 rush yards. Has 6 rush TDs in past 7, including 96 yards & 1 TD last week vs. Ravens. Has 20 career rush TDs, most ever by Bengal in 1st 2 NFL seasons. RB GIOVANI BERNARD averages 85 scrimmage yards in 2 career postseason games…Since entering NFL in 2011, WR A.J. GREEN has 6,171 receiving yards, 5th-most of any player in 1st 5 seasons. Led team with 1,297 receiving yards & joined CHAD JOHNSON (6, 2002-07) as only Bengals with at least 5 consecutive 1,000-yard receiving seasons. 1 of 2 players in NFL history with 5+ consecutive 1,000-yard receiving seasons to begin career (RANDY MOSS, 6). 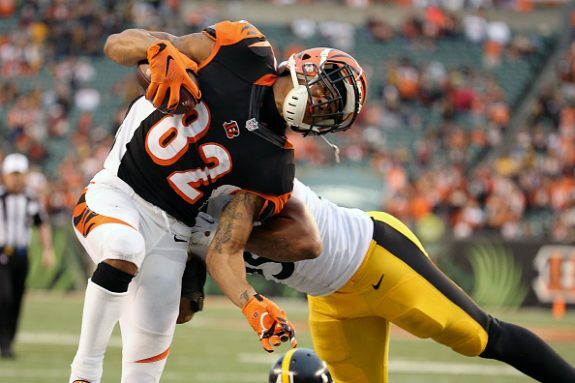 TE TYLER EIFERT led NFL TEs with 13 TD catches, most ever by Bengals TE in season…1 of 2 NFL teams to have 2 players with 11+ sacks in 2015 – DE CARLOS DUNLAP (13.5) & DT GENO ATKINS (11). Dunlap’s 13.5 sacks surpassed EDDIE EDWARDS’ single-season franchise record (13 in 1983). Atkins has 1.5 sacks in 3 career postseason games. S REGGIE NELSON tied for 1st in NFL with career-high 8 INTs. 1st Bengal to tie for 1st in NFL since DELTHA O’NEAL in 2005. LB VINCENT REY led team with 95 tackles…Club had 5 players selected to 2016 Pro Bowl (WR Green, TE Eifert, T ANDREW WHITWORTH, DT Atkins, S Nelson).